The COPA, the forecast and many other S4HANA, ECC and legacy tables contain hundreds of measures in their record structures. This format is not suitable for efficient processing in BI front end tools; e.g., WebI reports. The WebI P&L reports are performing the best when dealing with only one or few measures at most in a single record. The structure of COPA table does not meet this requirement. There is a need to transpose a record with dozens or hundreds of measures to multiple records with one of few measures only; e.g., current year and previous year values; adding Measure Id column to each record. This could be achieved performing Cartesian Transformation, on records of the original tables. The Cartesian Transformation could be performed during ETL or ELT processing. It could be also performed dynamically in HANA models. The above-mentioned documents describe how to transpose dynamically in HANA model a set of N records with M measures to a set of N*M records with a single measure using conversion matrix. Sometimes, several cumulative measures have to be exposed in resulting calculation view to calculate correctly non-cumulative measure in final HANA model or WebI report. Usually, Multiple Cartesian Transformations are required to expose multiple numeric columns in resulting calculation view. Each Cartesian Transformation would require a conversion matrix with 0 or 1 flag values. 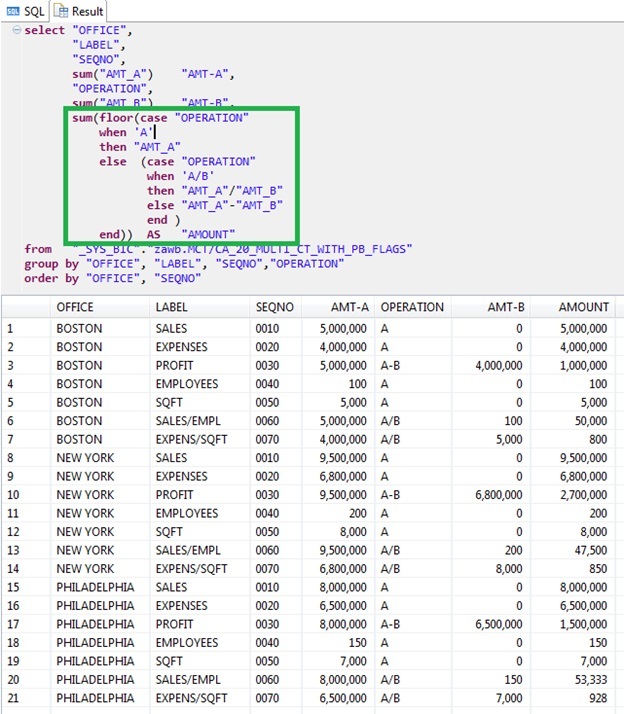 SALES, EXPENSES, EMPLOYEES & SQFT are base measures and could be aggregated in HANA interim models/views. 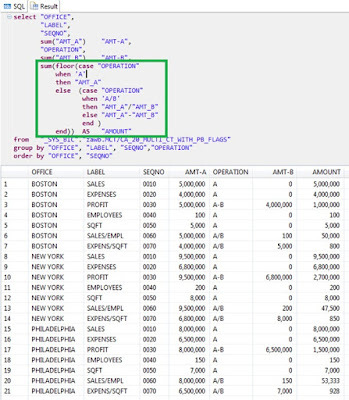 SALES_EMPL and EXP_SQFT are non-cumulative measures and must be calculated in final HANA model or WebI report from aggregated base measures: SALES, EMPLOYEES, EXPENSES & SQFT. 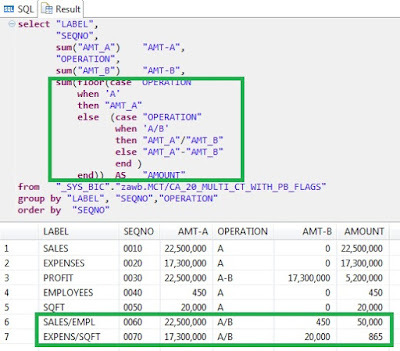 PROFIT; exposed as AMT_A and AMT_B values with corresponding Measure ID flag. PROFIT is a cumulative measure and could be aggregated same way as base measures or calculated in final HANA model as non-cumulative measures. In short, a pseudo-binary flag is a base 10 integer number that contains only digits 0 and/or 1. Each digit in the pseudo-binary number represents a single flag with value 0 for OFF and 1 for ON. The pseudo-binary integer number may hold up to 9 unique flags. The first right-most digit of the pseudo-binary number is considered to be the first flag. In the example above the Conversion Matrix contains 2 digit pseudo-binary numbers with the first right-most flag representing nominator conversion values and the second flag containing denominator conversion values. The AMT-A and AMT-B columns represent cumulative measures only. They were derived by 2 Cartesian Transformations implemented using single Conversion Matrix with pseudo-binary flags. 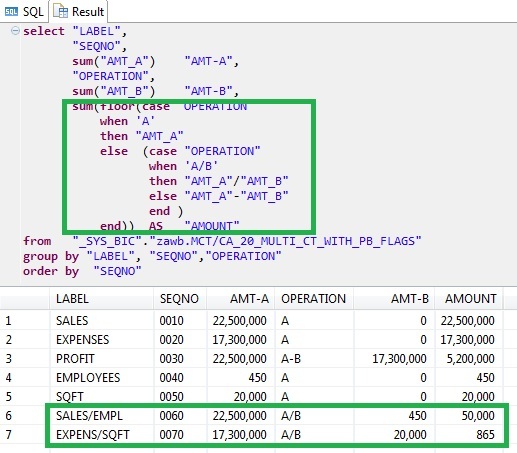 The AMOUNT column shows the final results derived in CASE statement executing expression in OPERATION column; i.e., A, A-B or A/B. The AMT-A and AMT-B columns represent cumulative measures only. They were derived by 2 Cartesian Transformations implemented using single Conversion Matrix with pseudo-binary flags. As these measures are cumulative, they can be aggregated without a problem.